“Monoprinting” is a process used in printmaking, as well as in textiles. It simply means a one-of-a-kind print. Using this delightful and spontaneous method with textile pigments, participants will create unique cloth for stitching and making collages.Using basic hand-stitches, we will create a series of small studies investigating the potent interaction of the stitched mark and painted cloth. We will examine how stitching can transform cloth by enhancing color, deepening space, and creating surprising visual textures.Come ready to explore, experiment, and surprise yourself! Monoprinting is a great way to unblock when you are creatively stuck and also is a method that presents us with happy “accidents” that inspire new visual ideas. We will use water-soluble pigments in this class: this ensures that after the workshop you can safely work at home without too much set-up. Ilze Aviks (BFA, Painting and Art History University of Kansas; MFA Fibers Colorado State University) has maintained a studio in Durango, CO for over 30 years and has taught workshops in textile design across the United States, Australia and Canada. Schools include Fort Lewis College, Penland, Arrowmont, Maiwa, Portland School of Art, University of Minnesota, and the Kansas City Art Institute. Aviks has contributed essays and reviews to Fiberarts, Surface Design Journal, and Telos Publications, and is the author of two workbooks: "Stitching as Mark-making" and "Stitch and Monoprinting." 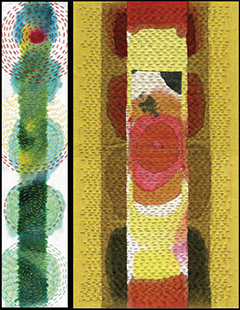 Aviks’ tapestries and stitched cloth are included in numerous public and private collections including Kaiser Permanente, Lore International, AT&T, and the U.S. Embassy in Riga, Latvia. Recent exhibitions include "Legends and Innovators", the Annual Penland Auction and “Selfies” at the San Antonio School of Art. I emphasize the experiential in cloth, rather than the descriptive. Every viewer has a tactile memory of cloth, as well as nostalgia for family quilts and linens. Like many artists, I consider limits a strength. In my work the random “seed stitch” is repeated thousands of times on each cloth and is the embodiment of time and perseverance. My current work explores the politics of mark-making in contemporary art. What is valid medium? What is valid subject matter? Who is the maker? So-called “craft” represents an alternative history and practice. The physical nature of the stitched mark reminds the viewer of a kind of activity and maker celebrated in world cultures, yet marginalized in traditional art history. I love teaching and gratefully share with students the powerful interaction of stitch and painted cloth and the value of slowing down the pace with hand-stitching. I am inspired as each artist uncovers her own “handwriting” and personal visual language. 12” or larger embroidery hoop (sturdy quilting hoop or square PVC pipe “hoops” found in craft/quilt stores). Tiny hoops are tooooo difficult to work with! SCRAPS of fabric for collaging (wools, prints, whatever). You don’t need tons of scraps. At least 3-4 yards TOTAL of assorted natural fabric – cotton, muslin, linen. ONE GORGEOUS PIECE OF CLOTH THAT WON’T BE PAINTED, but will be used over the four days as a stitching “sampler”. This could be a linen tea towel, or heavy-weight linen or cotton, about ½ yard. Silk is a bit tricky, so avoid silk, and watch out for tightly woven fabrics like poplin (too hard to stitch). This gorgeous piece of cloth could be from a thrift shop! The Shakerag Store, which is open daily throughout Shakerag, stocks most of these supplies in addition to numerous other items, including books, tools, t-shirts, and aprons.